Welcome to the Digital Edition of the May 2015 issue. • Global agency rankings of the top 30 agencies in the world. 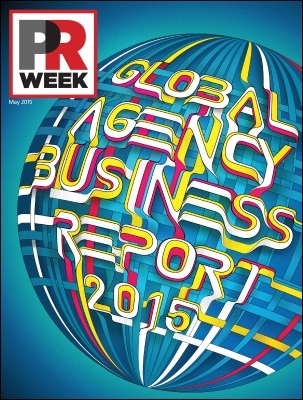 Our US agency rankings report the numbers on the top 150 agencies. • Profiles of 65 PR agencies. Who's doubling down in the Middle East? Who's poaching senior staff from other agencies? Who is landing and losing the big brand accounts? • Senior agency execs tell PRWeek how their firms are reaching a defining moment in terms of service, structure, talent, and opportunity. • Lévy, Roth, Sorrell, and Wren - Holding company CEOs offer a year in review and reveal what trends are driving their most successful strategies.